By default, all data in a request is passed unchanged from the ProxyEndpoint to the TargetEndpoint. Therefore, when the TargetEndpoint makes the request to the backend server, all information in the original request is passed to the backend service. The same is true for the response received by Edge from the backend service. By default, all data received in the response is passed unchanged to the app that originated the request. How is request data passed to the backend server? 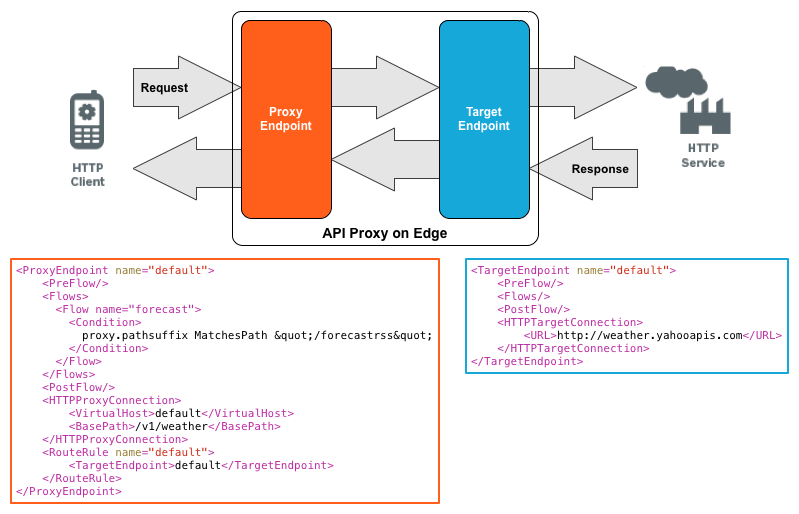 API proxy virtual host: "default"
Domain defined by the virtual host: "http://myOrg-prod.apigee.net"
TargetEndpoint specifid by route rule: "default"
There are many different flow variables created during the processing of a request and response. See Flow variables reference for more. In both examples, the headers and form data are passed unchanged to the backend service. The headers are represented by flow variables such as request.headers.count and request.headers.names. The form data is represented by flow variables such as request.formparam.count and request.formparam.names. How is response data returned? By default, all data received by Edge from the backend service in the response is passed unchanged to the app that originated the request. As described above for the request, the data returned in the response is accessible through flow variables on Edge. For more information, see Flow variables reference. To remove security information used by Edge to validate requests. That information is not required by the backend service. To add data sent to the backend service, for example to track users or to gather analytics. To conditionally process the request based on request data. For example, an API proxy can have multiple TargetEndpoints. The TargetEndpoint used by the request is determined by request data. You then strip that data from the request before sending it to the backend service. The same is true for data in the response. As part of processing the response, the API proxy might want to modify the data before returning it to the requesting app. In a normal flow, once the request has been processed, the proxy then sends the transformed request to the target. Policies can examine request variables, then transform or reject the request based on the content of those variables. Policies transform the request by setting the appropriate variables, for example variables corresponding to the request headers. Using the variables that apply to the response message, policies may access message components including the header, the query parameters, and form parameters, the source IP address, the HTTP message body, and so on. The proxy receives a response message, then applies to it a series of policies, based on conditions evaluated on the response, which can modify or transform the response. Policies can examine response variables, then transform or reject the request based on the content of those variables. Policies transform the response by setting the appropriate variables, for example variables corresponding to the response headers. AssignMessage policy: Creates or modifies HTTP request or response messages during an API proxy flow. Also creates and populates new flow variables. ExtractVariables policy: Extract content from messages, including headers, URI paths, payloads, and query parameters, for use in a condition statement. The policy then applies a text pattern to message content and upon finding a match sets a designated variable.